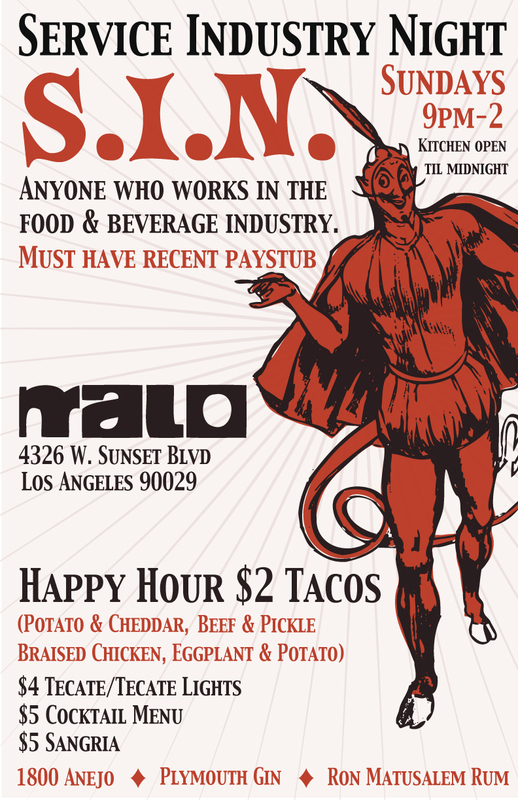 This Sunday, July 12th, Malo launches its Service Industry Night (aka S.I.N. ), which will take place every Sunday in Malo’s downstairs bar. S.I.N. is a special night dedicated to everyone who works in the food and beverage industry. S.I.N. will feature $5 cocktails with 1800 Añejo, Plymouth Gin, Tito’s Vodka, Cointreau, Ron Matusalem and more. The kitchen will serve up $2 Happy Hour tacos, including potato and cheddar, beef and pickle, and braised chicken. Just make sure to bring a recent paystub and you’re good to go!